This is the second exhibition in the LoBe Gallery, Berlin. Both artists worked with the space in the state of flux as it progresses from a space layered with the evidence of years of different uses and occupancy, to a renovated gallery space. This exhibition responded to the space cleared of carpets, ceilings and wallpaper, stripped out but rough and damaged, full of walls patched, holes drilled and plasterboard smashed. Westerman responds to the LoBe space with a series of new drawings, focusing on the blemishes and the physical damage the space sustained, building graphic models of the traces. Working directly on the walls ceilings and floor of the LoBe spac. 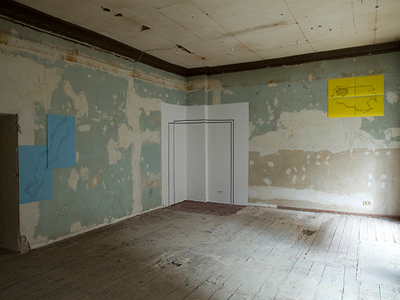 Stephan Hüsc use tape to extend the gallery. This play on space and perception turned the corners into a series of geometric portals.